The King of Crustacean Goes Japanese! 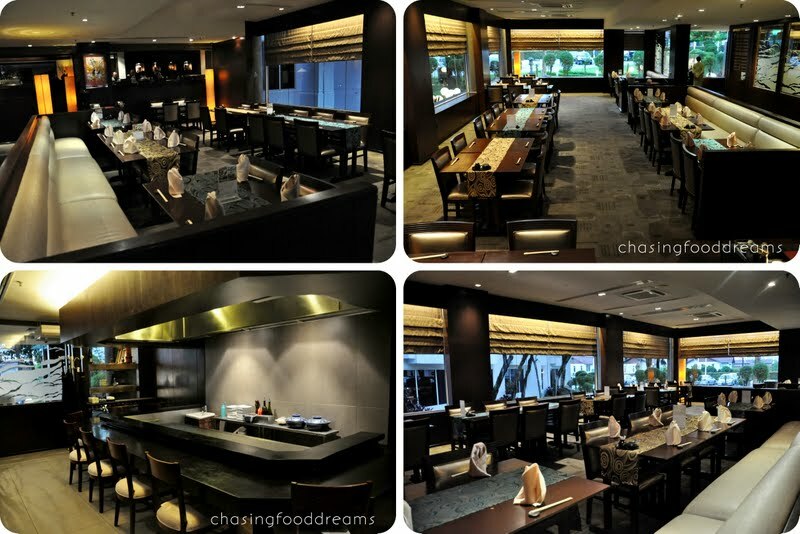 Fu-Rin Japanese Restaurant, located at Holiday Inn Kuala Lumpur Glenmarie, has been serving up scrumptious Japanese cuisine for the longest years that I could remember. Faithful followers will attest that Fu-Rin, an award winning Japanese restaurant, is the restaurant to go to for Japanese cuisine with a modern twist from its freshest cut of sashimi to its main dishes and more. Starting November this month till end of December 2014, Fu-Rin is proud to showcase the king of crustacean, Boston Lobster prepared in several ways in their Boston Lobster Delight promotion. Before we take on the lobsters, here’s what Fu-Rin also has available to tempt your senses. Just like its ambience and surrounding, Fu-Rin offers dishes that evoke a sense of Zen flavours. All of their dishes are beautifully created with the finest and freshest ingredients from land and sea. The Sashimi Bar alone is a plethora of fishes and seafood. Wine is also available at Fu-Rin to be paired with Japanese cuisine. And so it is without any doubt that we should start any Japanese meal with a platter of Sashimi Moriawase! Showcasing thick glorious cuts of Salmon, Yellowtail, Snapper, Scallop and Sweet Amaebi, the sashimi is served on ice to keep chilled. The sashimi is divine, tasting wonderfully sweet with hints of oceanic notes of the sea. Even the prawns, which I am not really a fan off, were firmly gelatinous with much sweetness in every bite won my heart. Another roll that also peak our interest was the Fu-Rin Creamer Roll, an assorted seafood roll with mayonnaise. Looking like a hot mess, the rice roll had a filling of tempura battered seafood, lettuce and cucumber. It was then smothered in an eggy mayo sauce, topped with tempura flakes, torched, sprinkled with pink peppercorn and drizzled with sweet sauce. The combination of flavours and textures are pretty much awesome with loads of luscious and creamy notes, burst of spicy peppercorn and savory sweetness. These golden Ebi Tango Furai balls sure looked adorable. Made with minced prawns, these were lightly breaded and fried to a lovely golden color and served with sliced cucumber and cherry tomato and a spicy tangy cream sauce. The prawn balls have a lovely firm and springy texture with lots of sweetness. Wasabi Beef was a crowd pleaser that evening. The few of us just couldn’t get enough of the thinly seared and slice beef served on a bed of finely shredded radish, onions and doused with a wasabi tinged ponzu sauce. The tender beef has a melt-in-the-mouth texture while the savory tangy wasabi sauce is an explosion of flavours in the mouth. I personally love the addition of wasabi in this classic dish. Our highlight of the night was Ise Ebi Teriyaki, Lobster Teppanyaki. Looking at the crustaceans left us all in awe. The Boston Lobster was split open and cooked teppanyaki style with butter soy sauce. It was finished with an egg batter and drizzled with mayo and sweet sauce. One can definitely tell how good this already is. The lobster meat was tender and sweet. Chunks of the meat are well flavoured with the combination of the savory, sweet and creamy flavours. The egg on top is also pretty much addictive. I should have taken a photo of the lobster meat but as soon as we all took a bite, this was just polished off in a jiffy. Proof is in the pudding, it’s just that delicious! We ended the evening with a simple note of Yaki Soba. The buckwheat noodles are prepared with classic flavours and come with cabbage, fish cake, seaweed and bonito flakes. Set includes appetizer, soup, main course and dessert and is priced from RM 395.00++(4 person). Contact Fu-Rin Japanese Restaurant at +603 7802 5245 or email to dining@holidayinnkl.com.my for reservation and more details on this promotion.